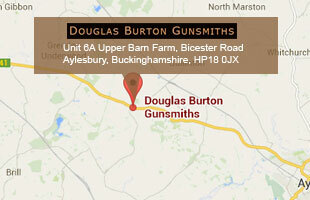 Douglas Burton Gunsmiths provide knowledgeable advice and assistance to valued clients from our dedicated workshop in Westcott, a small village on the edges of Aylesbury in Buckinghamshire. We believe that the purchase of a gun or a rifle should be amongst the more rewarding and enjoyable experiences our clients encounter whenever they choose our services. We are committed to offering every client the information required to make an informed decision on their choice of gun or rifle from our own extensive range of options. We provide the same levels of assistance to all clients irrespective of their budget size and their personal shooting requirements. Douglas Burton Gunsmiths warmly invites all website visitors to our workshop where we look forward to meeting you in person. We promise to extend a friendly welcome to all prospective clients and we look forward to giving you our personal care and attention.